« “No Off-Road Means No Off-Road! 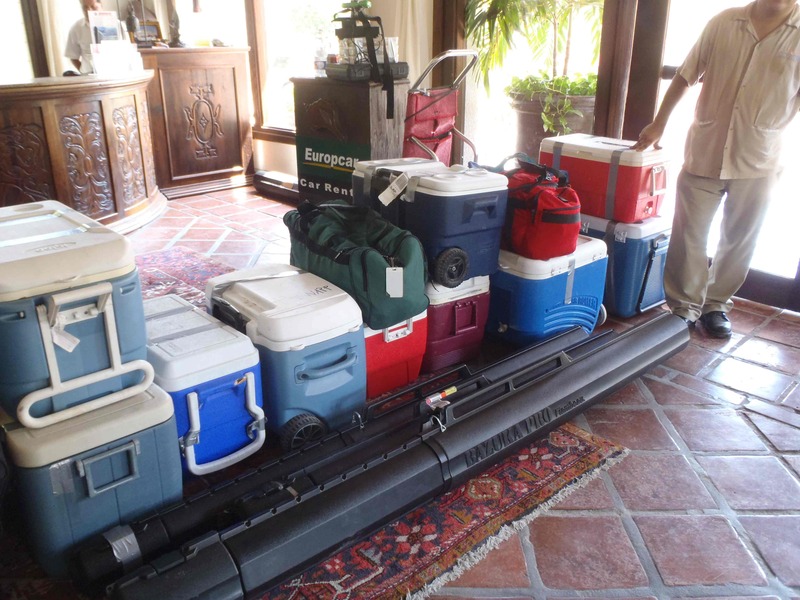 There’s a right way and a wrong way to pack for a fishing trip to Baja. And then, there’s EASIER ways to do it right! It’s an irritation, but something we’ve gotta learn to live with these days. Like taking your shoes off at the airport. Like having your expensive shampoo taken away at check-in. I’m sure greater and bigger minds than ours have figured out why they are important aspects of airline travel these days. We empty and open our bags and pass our stinky shoes through the conveyer belt and do our little spin in the x-ray scanner. Like the hokey-pokey. That’s what it’s all about. One thing for sure is that the days of free luggage are something we use with words like “back in the day” and “in the olden days.” The more you bring, the more you’ll get charged. It kinda makes you cry as you stand in your garage and you look at all your custom rods, reels, feathers, jigs and other toys. You want to bring them ALL! Almost 30 years ago, I remember my first trip flying to Baja. I took 10 rods and reels (two tubes); a tackle box that weighed about 50 pounds and almost 30 marlin lures (that my buddy had borrowed from WON editor Pat McDonell who didn’t know who I was at the time!). Oh, and two 85-quart ice chests as well. And this was for fishing in a panga for only 2 days! Nowadays, you get one piece of luggage. If you’re lucky. Economy airlines charge for each piece of luggage. Rod tubes are oversize. Pay extra. Cha-ching! Reel bags too heavy. Pay extra. Cha-ching! Ice chest…even with nothing in it. Pay extra. Cha-ching! But, a man must do what a man must do and the fish are calling! So, we just have to think from a different angle. Consolidate and downsize. Before purchasing your airline tickets, find out if the airlines has a special luggage allowance you can purchase. Some airlines (Volaris comes to mind) allows you to pay a little extra up-front when you purchase your tickets online. This allows you to bring more luggage and more weight for a fraction of the cost. If you just walk up to the counter with all the extra weight, they charge BY THE POUND! For example, we had some clients who purchased $200 round trip tickets to fish with us in La Paz. We told them to purchase the extra luggage allowance. They declined to do so. When they flew back to the U.S. they had several very full ice chests. It cost them almost $600 to fly the fish back. OUCH! For practical purposes, take a look at your own gear, if you’re planning to travel. “Back in the day” multi-piece travel rods were junk. Nowadays several very good manufacturers and a number of custom rod wrappers are making some super 2 and 3-piece travel rods in varying lengths and strengths. Many of them come with handy cases and can literally be carried in the overheads or packed into suitcases. They even make break-down trolling rods. For reels, here’s my suggestion. Pair it down to some essential reels. Match your reels to what you’ll be fishing for. You don’t need a bowling ball-heavy 5/0 wide reel if you’re going to be fishing inshore in 100 feet of water. With the new aluminum reels and their horse-strong drags, you can use smaller/lighter reels to get the job done. Even for trolling. I would also suggest putting spectra on the reels then put 150 yards of mono top-shot on them. That way if, for example, the 40-pound test mono isn’t working, all you have to do is change the top-shot to whatever line is the hot ticket for the bite. You won’t need a separate reel for that. For terminal gear, be practical. If you’re only fishing 3 days, you don’t really need 500 hooks of all sizes. You don’t need 20 throwing irons. You don’t need 10 feathers of all colors. If you can, contact your outfitter ahead of time and find out what’s really working. Bring the essentials. While you’re at it, pow-wow with your fishing partner. Consider packing all your rods together. In one tube. Each of you doesn’t need to bring a whole set of lures, hooks and other essentials either. You can both share and thereby cut down on weight and gear. As for bringing the fish home, if you’re like me, it always irritated me to pay to bring an empty ice chest down to Mexico. Paying for air? C’mon! What I’ve been suggesting lately is using the newer soft-sided coolers that are airline rated heavy duty; keeps things frozen for days; and can be folded and packed into your suitcase on the way down. We’ve had one made by American Outdoors that has worked like a champ for about 5 seasons. Another nice thing is that these weigh less than a traditional cooler. Since most airlines limit you to 50 pounds on luggage, you can get more actual frozen fish in a soft-cooler than a hard-sided cooler that weighs 8-20 pounds with wheels on them. One last thing. In the old days, my buddies and I brought down one or two sets of shorts and t-shirts with us. That was it. Our motto was, “if you can’t wash it in the sink, don’t bring it.” That was a great way to save room for more tackle. Of course, that was in the days when my buddies and I were all bachelors.